Jaques Anderssen Chessmen,Drop Jaw Style, Tournament Size. 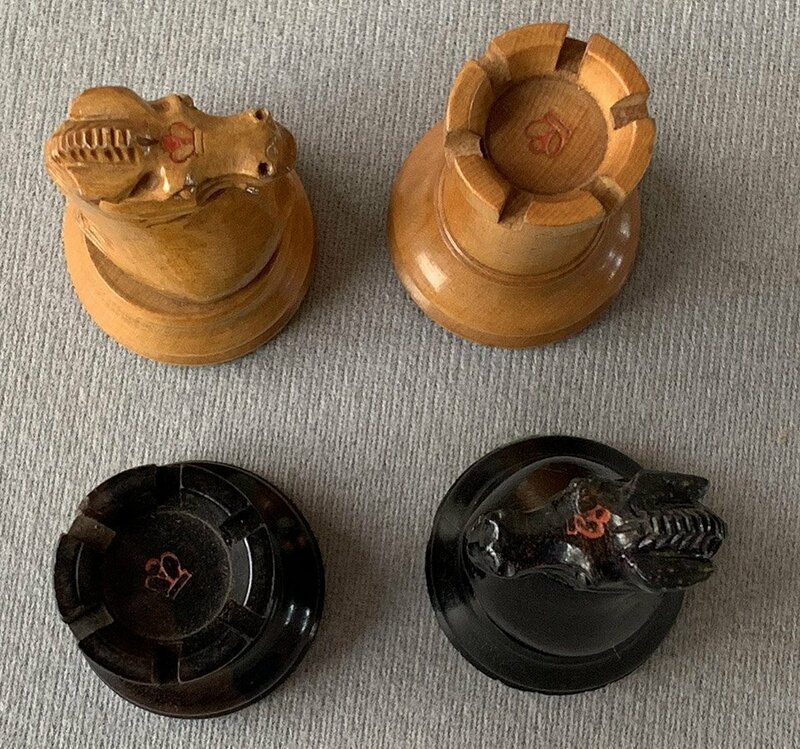 Offered here is a set of antique Jaques Anderssen Chessmen, Drop-Jaw style, circa 1862. 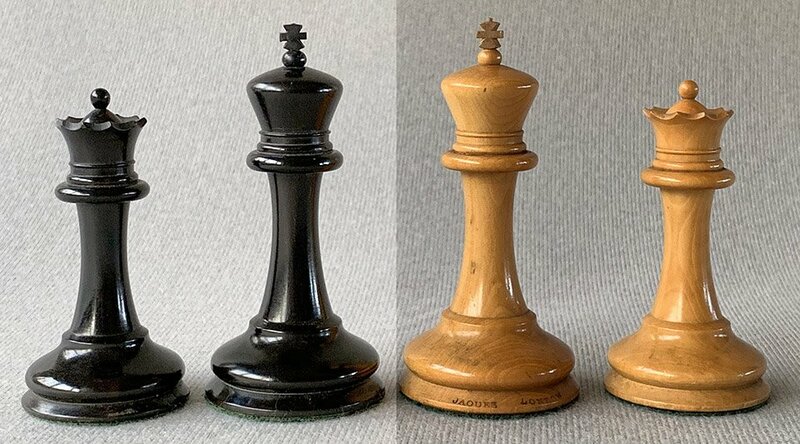 The chess pieces are Boxwood and Ebony, weighted and rest atop green baize base pads. The King stands 3.4″ tall with a 1.7″ diameter base. The Knights are the Anderssen Drop-Jaw style. The Bishops feature the wide open miter, so typical of the original Jaques Chessmen design. 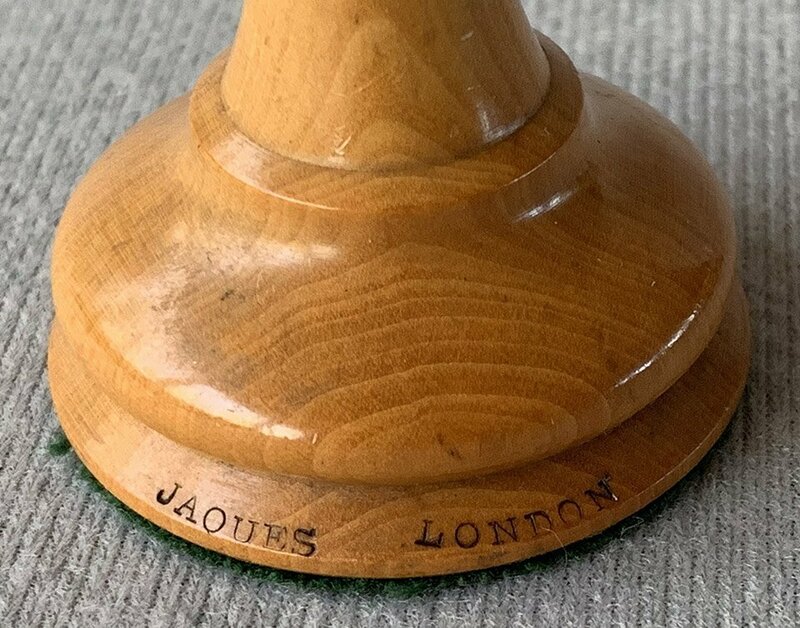 The White King is stamped “Jaques London ” on the rim of the base. The Kingside Rooks and Knights are stamped with a King’s crown on their summits. This King height is often referred to as the standard or “Tournament Size.” The Jaques Anderssen Chessmen are housed in their original Mahogany hinge-top box with the original green Jaques maker’s label. 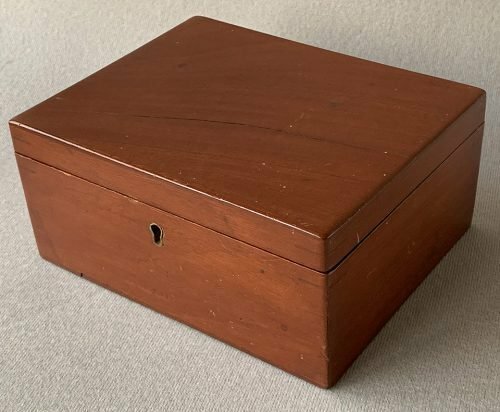 The chessmen and box are in truly superb condition for their age. These Drop-Jaw style Jaques Anderssen Chessmen play and display best on a chessboard with 2-1/8″ or 2-1/4″ squares. 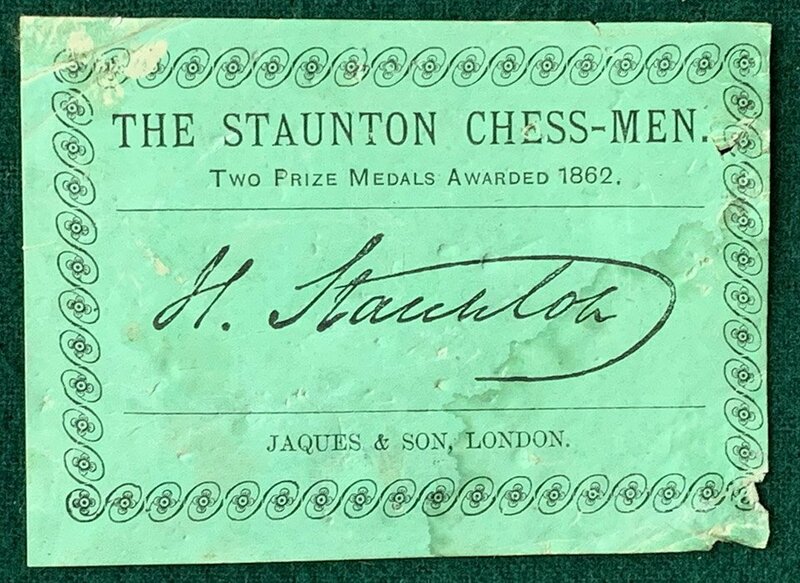 A correct period Jaques chessboard with label can be purchased here. For a complete selection of our finest new and antique chessboards, click here. For our extensive selection of contemporary and antique chess timers, please click here. For more on the background of the John Jaques company, click here. 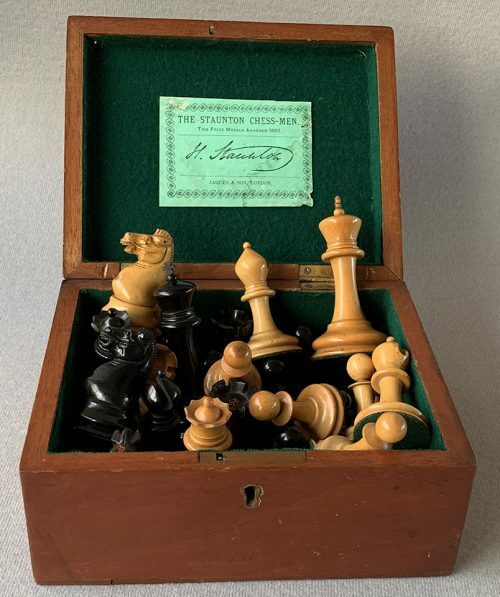 For a history of the Staunton Chessmen, click here. Karl Ernst Adolf Anderssen was born on July 6, 1818 in Breslau, Germany (now Wroclaw, Poland). He is considered to have been the world’s leading chess player for much of the 1850s and 1860s. Anderssen learned to play chess from his father at the age of nine. Anderssen worked as a professor of mathematics at a local college. Although he loved chess it was only considered a pastime, not his profession. Anderssen was very successful in European tournaments from 1851 to 1878, taking first prize in over half of the events in which he played. Anderssen ranks as one of the top five players from 1851 to shortly before his death in 1879. Anderssen’s finest performance was the famous London Tournament of 1851. This is recognized as the first major tournament of the Modern Era. Anderssen triumphed in a knockout tournament boasting the 16 best players in the world. 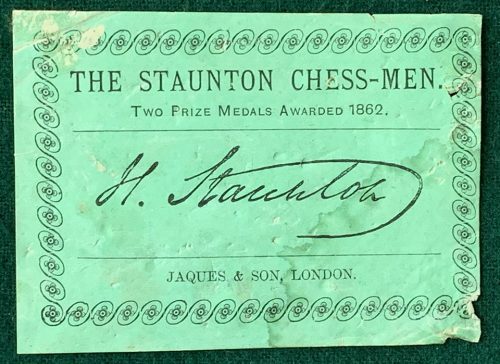 Although Wilhelm Steinitz is recognized as the first official world champion, the organizers of the 1851 London International tournament considered the winner of this premiere tournament to be the World’s Chess Champion. That title was short-lived when Anderssen was quite soundly defeated by Paul Morphy in their 1858 march. However, Morphy abruptly retired from chess and Anderssen was again considered the World’s leading player. It is interesting to note that Anderssen achieved most of his successes when he was past 50 years of age. Anderssen is famous even today for his brilliant sacrificial attacking play, particularly in the “Immortal Game” (1851) and the “Evergreen Game” (1852). Steinitz rated Anderssen as one of the two greatest attacking players of his time. An unassuming man, Anderssen was one of the most likable of chess masters and became an “elder statesman” of the game. Anderssen died on March 13, 1879, in his hometown. The Deutsche Schachzeitung noted his death in 1879 with a nineteen-page obituary. His cause of death was a heart attack. Anderssen’s grave is now at the Osobowicki Cemetery.